Screen flows, wireframes, prototypes and guts. Following on from my last post where we were looking at gathering user research and requirements, here’s an update on the recent team workshop where we focussed on the structure and skeleton of the LAMP. We kicked off the session with a 20 Second “Gut” Test, which is technique used to clarify preferences, and better understand the team’s views on the aesthetics of visual design. 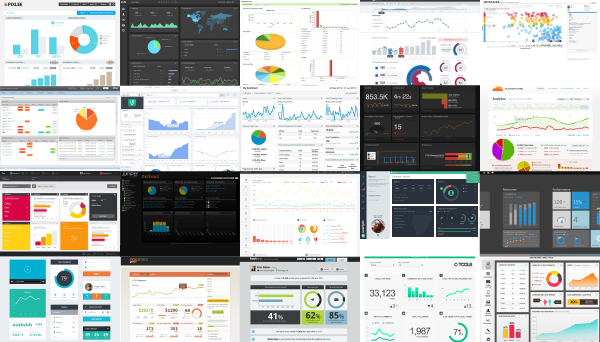 The test showed a screen capture of 20 different analytics dashboards / user interfaces / visual elements, for 20 seconds only. Each participant has to score their gut reaction to the slide 1-5 (5 being the highest) and make any notes. Visualisations of the data were honest and unadorned. The navigation model is the big picture, or the “birds eye view” of the system. It considers where users start, how they get from here to there, and what all of the major elements will be. 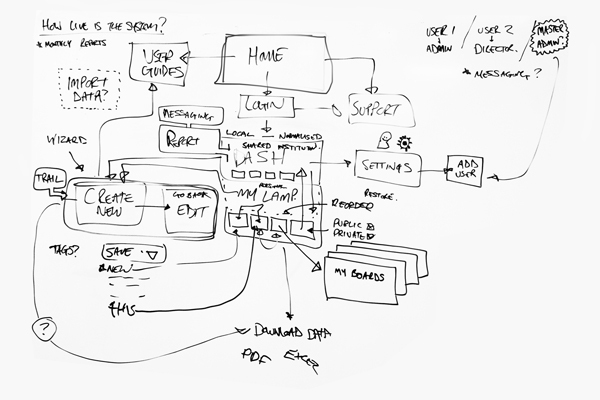 This can then be summarised as a flow diagram that the models the user journeys. We started off as a group using our understanding of the tool to build a prototype screen flow. We then validated this against the real life use cases / job stories. We then tried to break the system we’d created. What were the extreme limitations of the system, and had these been taken into account. This followed an iterative design process: Sketch > Prototype > Present > Validate > Repeat until we had exhausted our time. Collectively we had formulated a solid idea that, that has been validated against our user research. This can now be taken away and explored in more detail by the UX team, modelled and then presented to the CAB for feedback. Based on the screen flows and navigation model we had created it was clear that there were 2 key areas of action to focus on; the chart creation screen and the Dashboard area where charts are stored. We wanted to start understanding these in more detail and begin to wireframe the user journey, the interactions and functions of these screens. We had generated loads of ideas for these screens and we needed to capture them. We’re not intending hammer down every detail but rather to create a consensus that can be refined outside of the workshop. It’s a prototype — Not the Mona Lisa! Reduce risk prototype early and often. The first iteration of wireframing follows a 6-8-5 rule – do 6-8 sketches, on an 8-up grid in 5 minutes. The sketches can be different versions of a particular aspect you’re working on or a storyboard workflow (before, during and after login) or mix and match! Keep it high level, and get just enough detail down, to convey your concept. When the 5 min is up each person presents their ideas and the group critiques the ideas. Quantity trumps quality at first. The idea here is to get a large quantity of ideas rather than quality. Here’s a short example to illustrate what we mean by this. “A ceramics teacher announced he was dividing his class into two groups. All those on the left side of the studio would be graded solely on the quantity of work they produced, all those on the right graded solely on its quality. This story perfectly articulates one of the fundamental Lean UX principles: prioritize making over analysis. Instead of sitting around, debating ad nauseam which direction to go in, what features make sense, which colors perfectly reflect your brand values or which words will get your customers to convert, just make something. It won’t be perfect. It won’t work as well as you’d hoped at first but it will teach you something. You’ll get some feedback, some insight on how building your product can be better and you’ll do a better job the second time around. A lot of the methods and ideas we’ve used in this workshop have been taken from ‘Prototyping – A practitioner’s guide’ by Todd Zaki Warfel (http://rosenfeldmedia.com/books/prototyping/). In his book he talks about the value of prototyping, the value of show, tell and experience. Take a 60 page requirements document. Bring in 15 people into a room. Hand it out. Let them read it all. Now ask them what you’re building. You’re going to get 15 different answers. Prototypes are a more concrete and tactile representation of the system you’re building. They provide tangible experiences. He then goes on to say moving from requirements-dependant process to a prototype-dependant process has increased consensus on interpretation to 60-80% to +90%. It also requires far less effort and time for everyone involved. Taking this user centred design approach is essential for LAMP as the system is still being explored, designed and interpreted. Manifesting the development work in a physical form helps to generate hundreds of ideas, some will be great, some will be not so. But even these not so great ideas can be the catalyst for great solutions. The ideas that were generated will be explored in more detail by the UX team, modelled, and validated. We are then meeting again for another wire framing session with the LAMP team to work through more of these details ready to presented to the CAB for feedback.